Are you interested in articles about marketing strategy? this post contains all the necessary details of the biggest marketing strategies to apply in business for 2019 and beyond. The survival of any business depends on the proper determination of strategy which involves the general situation pertaining to the business as a whole & decides upon necessary changes of fundamental nature. 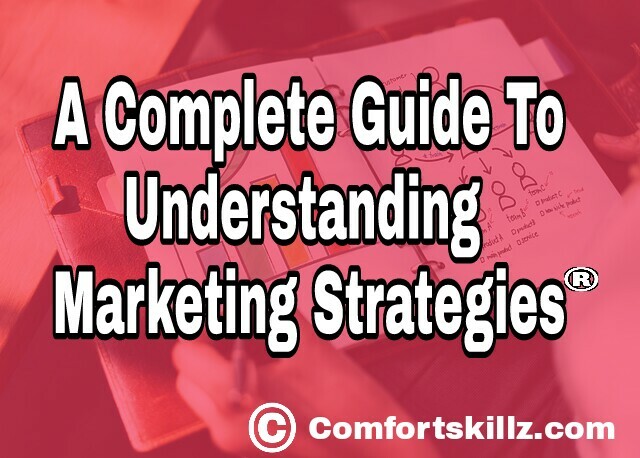 According to Philip Kotler, marketing strategy is a consistent, appropriate feasible set of principles through which a particular business hopes to achieve its long-run customer profit objectives in a particularly competitive environment. The marketing function is very important in any business because it is a function that generates income for the business to grow and move forward. Therefore, It is essential for entrepreneurs (businessmen) to give it an appropriate attention. It's important for entrepreneurs to understand the basic objective of marketing, what it is and how it can be applied in business effectively. Unfortunately, business managers and entrepreneurs are often ignorant of the importance of such strategic planning and thereby resort to guessing works. It is therefore imperative for an entrepreneurial firm to define from the start its type of business and the market it wants to satisfy. A business may decide to go for either the mass or niche marketing strategy in selecting its target market (buyers). Mass targeted marketing strategy is a situation where all potential customers in a product-market are assumed to be sufficiently similar in their response to a marketing program positioning strategy. Whereas in niche targeted marketing strategy, the firm assumes that people or organizations within a product market vary in the area of their response to any marketing program positioning strategy. A niche strategy can be implemented by going after a single niche or by designing a separate marketing program for each of two or more niches. The niche strategy can afford a business with the opportunity to greatly increase profitability & strength over the competition through the more effective use of the capabilities & limited resources. offerings, prices, distribution, promotional efforts & services towards that particular market segment. The main focus of applying strategies in business is to address customer needs which are not being currently met in the marketplace. A good strategy implies that a business cannot be all things to all people and must analyze its market alongside its own capabilities so as to focus on a target market it can serve better. You may also want to read: How to write cover letter for job application. Advertisement: Advertisement is a key part of the marketing process and it is a tool for promotion. The purpose of advertising is to make potential buyers and existing customers respond positively to a business and/or its product or service. Essentially, it informs, persuades and reminds the target audience of the product or service and helps to create awareness and loyalty. Advertising is the paid and impersonal attempt by an identifiable sponsor to provide the most persuasive message to the right prospects through mass media at the lowest possible cost. To maintain and increase demand for well-known products. Sales Promotion: Sales promotion is promotional techniques that are neither personal sell nor advertising. Sales promotion consist of the inactive tool, mostly short-term, that is designed to stimulate quicker or greater purchase of particular products or services by consumers. Whereas advertising offers a reason to buy, sales promotion offers an coupons, premiums, price deals, rebates, free trials, warranties, and demonstration. Personal Selling: Personal selling is one-on-one communication between the business and a customer so as to convince the customer to buy. For personal selling to be effective, the sales-person must find out the needs of the customer and match the goods and services of the business to those customer needs for the mutual benefits of both parties. Publicity: Publicity is information about a business, its products or services that appear as a news item. Publicity is not usually paid for by the business. It can be done through other methods such as press release, sponsorships, events, publications, speeches, etc. Place (or Distribution): Place or distribution is very important in business. No matter how good is your product and how affordable is its price, without distraction it will be a useless effort. No wonder in economics, production is said to be incomplete until goods and services get to the final consumers. Distribution is concerned with getting your products or services to the target market. It is the establishment of a system that gets your products to where the consumers want to buy them. You can also check out the: 9 Amazing Business Growth Strategies of all time. There are different ways you can get your product to your customers and these different is ways are called Channel of Distribution. A channel of distribution is a system of pot organizations that get goods or services from the producer to the consumer. As a producer, you can decide to sell your products or services directly to your customers or pass through the wholesalers and retailers. Producer ==> agent ==> wholesaler ==> retailer ==> consumer. Your customers i.e. your target market: This includes their location, their number, their preferences, etc. Your product: The Consider whether your products are expensive, bulky, made to customer's specification, go out fashion, need specialized services, have a short lifespan, etc. Your own resources should you want to distribute the products yourself. Your competitors, the channel they use and their possible reactions to your choice of channel. Environmental factors such as the economic, legal, technical factors. If you followed above Marketing Strategies, then be sure to keep 90% of your targeted buyers to your business and get repeat products and services demand as well. Wow! This article really made my day! Hey Milli, this is indeed a nice article you got here! i must say this is the perfect steps to take for effective marketing strategy, with the above tips am going to utilize it well on my marketing campaign. Thanks for sharing, it was really helpful. Thanks for the encouraging words. Nice to have you around. Am glad that you found the article very useful. You're welcome!